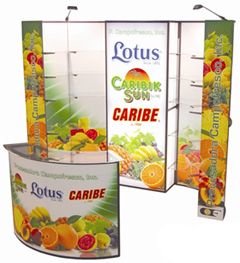 Combine basic FabPop curve displays with a center backlit FabPop to add contrast and emphasis to a section of your display. 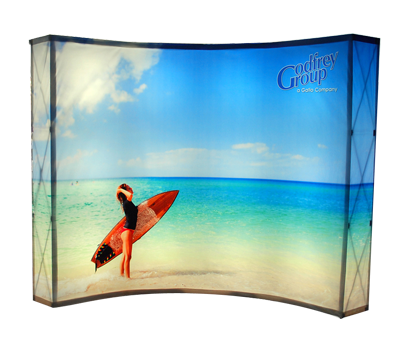 This example uses a straight backlit Fabpop center display with two front-lit 8 ft curve Wavetubes, with options, to give a custom look to the 20 ft display. 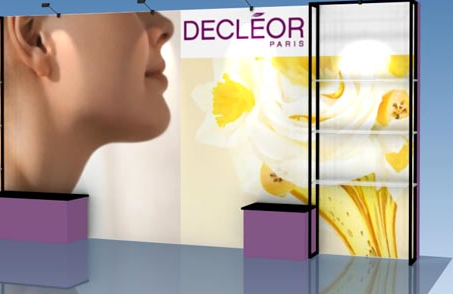 Backlit FabPop Displays create a “brightwall” that can’t be ignored at any event. 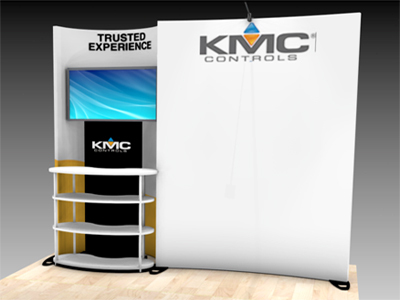 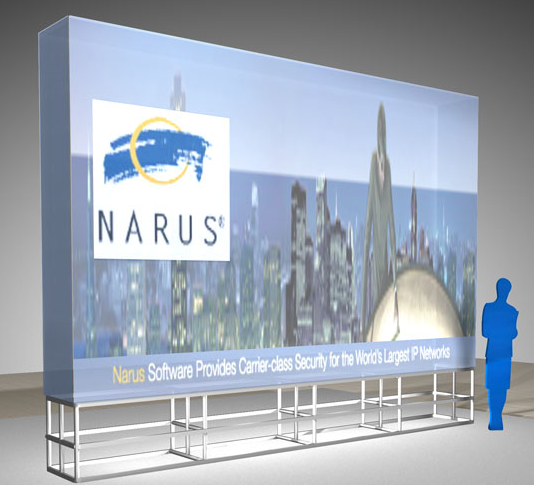 This 10 ft display uses an 8 ft center section display and two 5 ft side return displays, all with internal lighting. 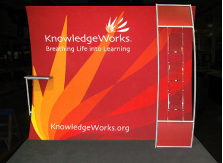 A brightwall makes you stand out in the crowd. 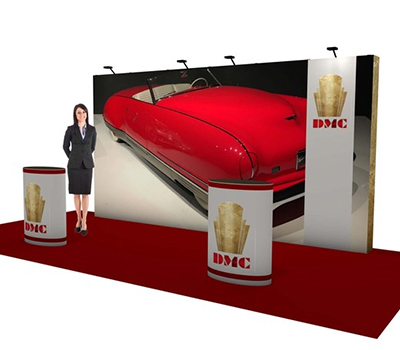 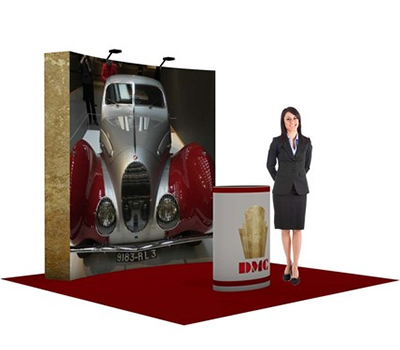 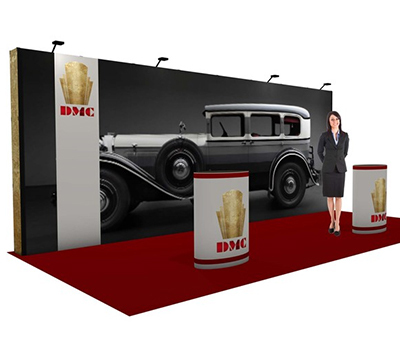 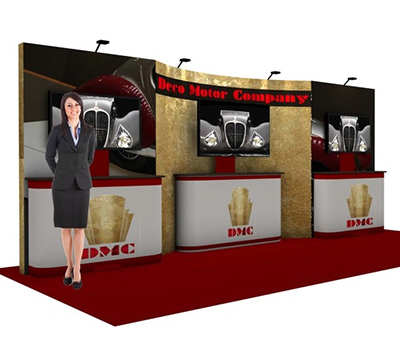 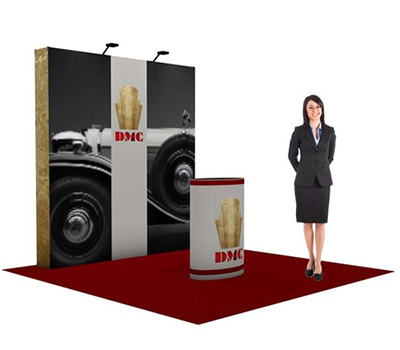 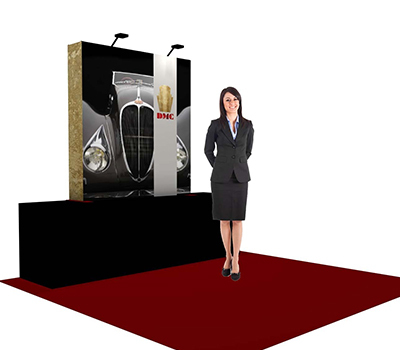 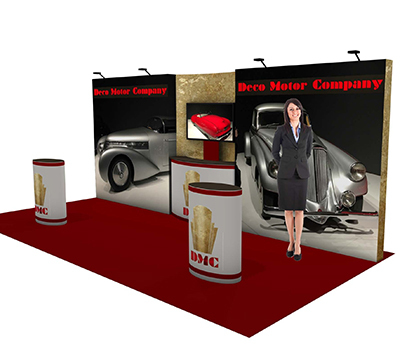 The standard height of most event displays is approximately 8 ft. To dominate your event or provide an oversize backwall for news media, you can choose a larger FabPop up to 16 ft high. 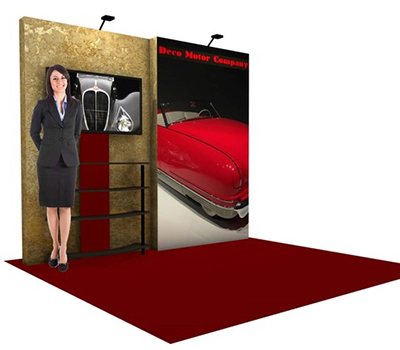 The FabPop Pop-Up Display is a great budget option for events. 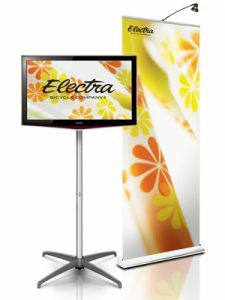 It offers fast setup in a full-size display. 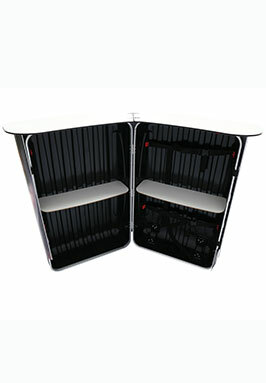 It is lightweight and compact to transport or ship. 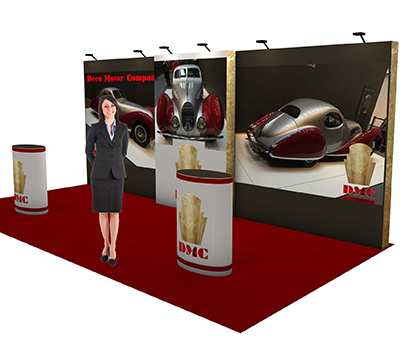 It is also the most economical display wall. 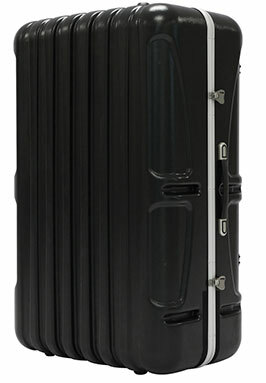 The lightweight aluminum alloy frame locks in place using snap-in-place hooks. 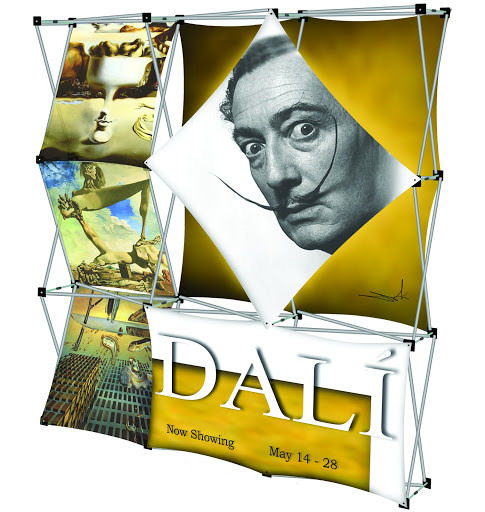 Fasten the graphic to the frame with simple hook & loop tasteners (or push-in fabric graphics for larger walls). 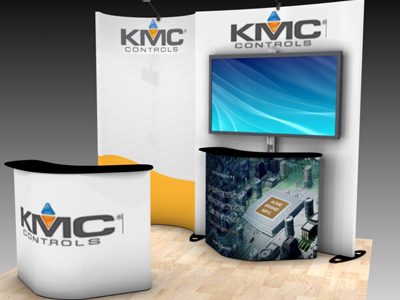 Interchangeable graphics make it a versatile choice. 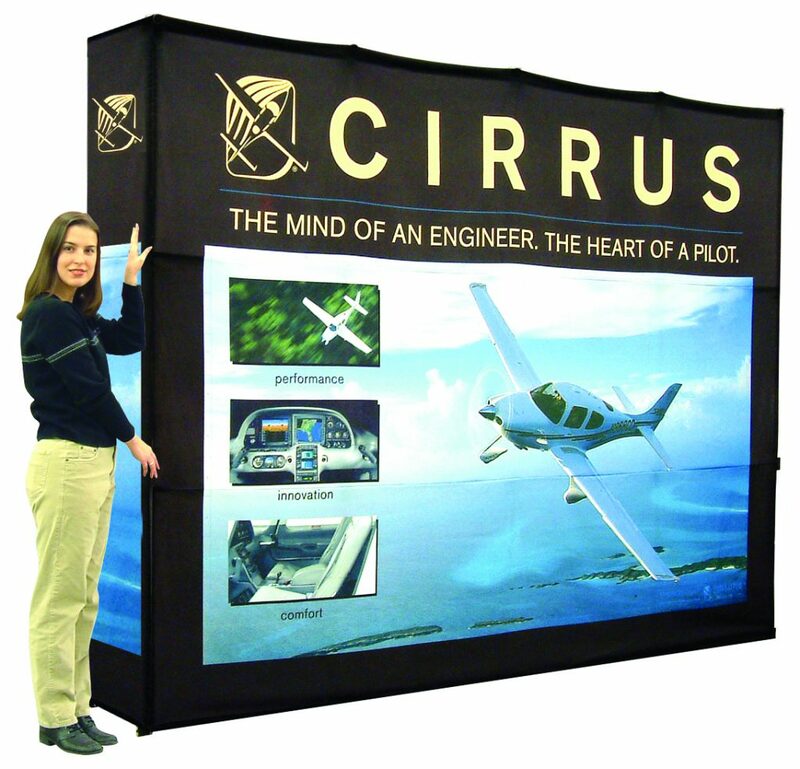 Easily collapse the standard frame with front graphics attached and stow in the transport bag, included. 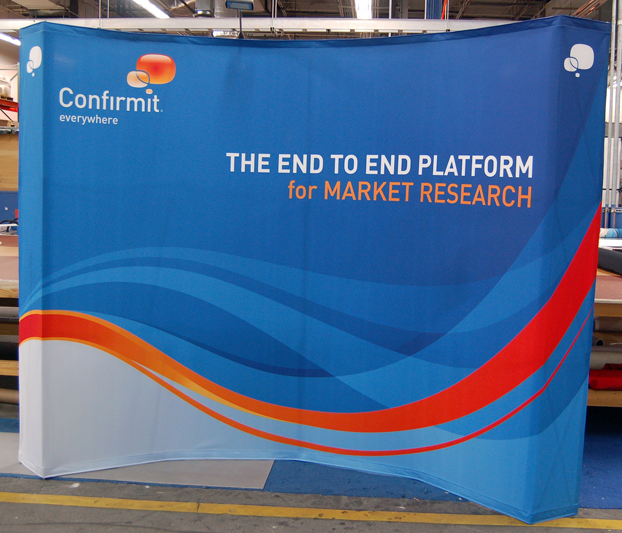 The fabric graphic travels attached to the frame for an instant event. 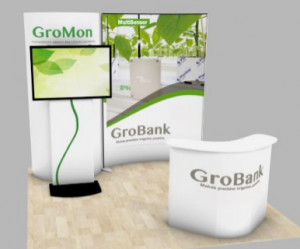 The standard FabPop is available in sizes from 5ft table tops to 10ft straight or Curved floor models from 5ft to 30ft wide, all approximately 90″ high. 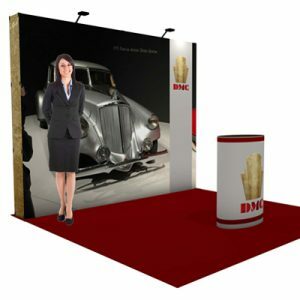 Larger, oversized walls are options for straight display walls to combine with backlit walls and standard size walls for a custom look, all at a fraction of the custom price. 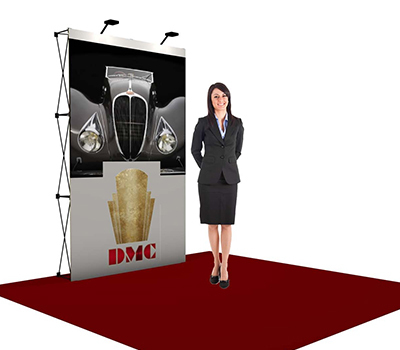 The system offers optional floodlights (recommended) and shipping cases that convert to a graphic-covered podium or counter for work and writing. 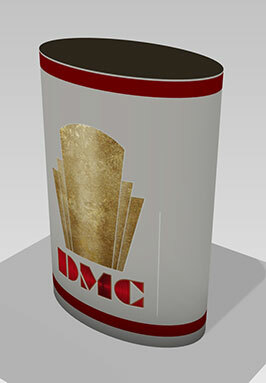 Double-sided graphics are also an option. 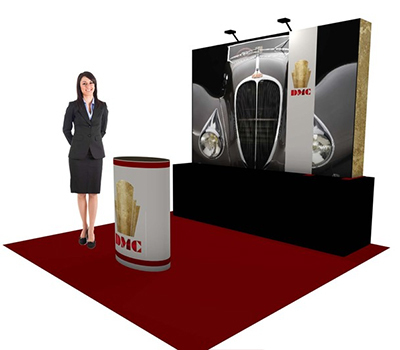 Its versatility and simple 10-minute setup, as well as its simple graphics application, make it functional for special events. 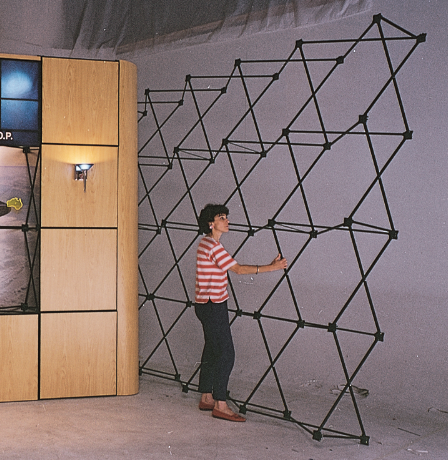 Shown at left is the standard 5ft FabPop display without end caps for a clean billboard presentation. 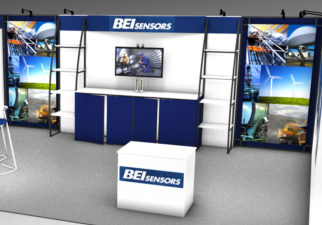 Shown at right is a display with optional end caps concealing the frame for a more finished look. 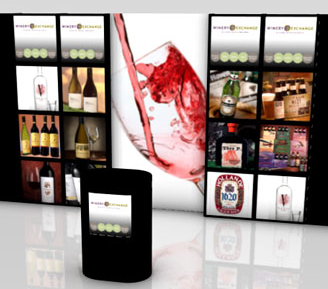 For Double sided graphics add 30% to display prices . 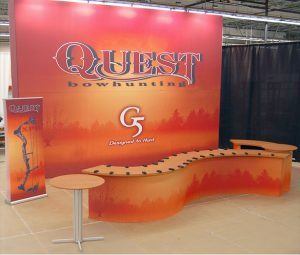 See below for optional counter cases, video Stands, Spotlights. 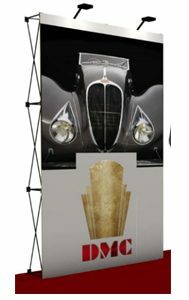 30ft and larger custom sizes available. 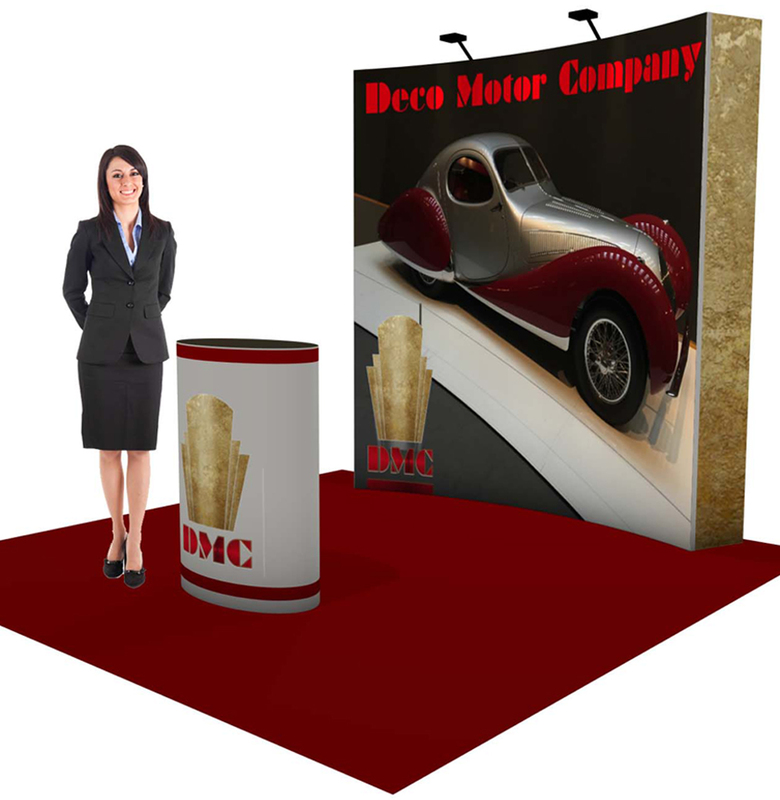 Spotlights. 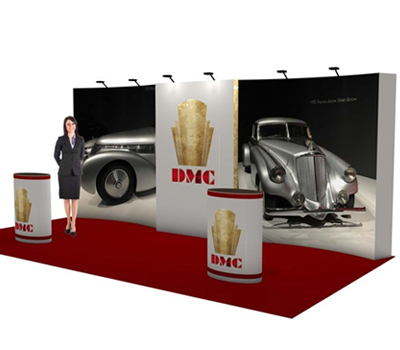 30ft and larger custom sizes available. 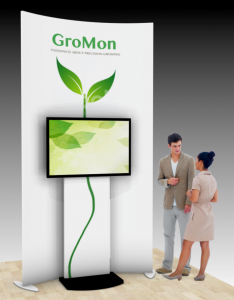 parts of the display without changing the complete graphic. 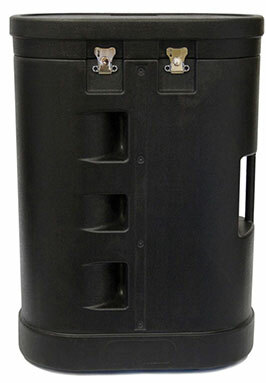 Two FPL3X3CRVG1 & One FPL2X3STRG1 w/ end covers. 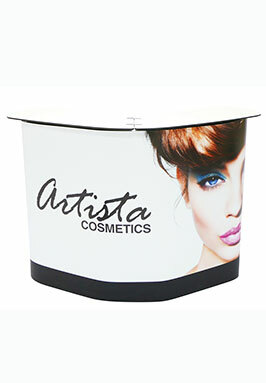 For Double Side graphics, add 30% to price. 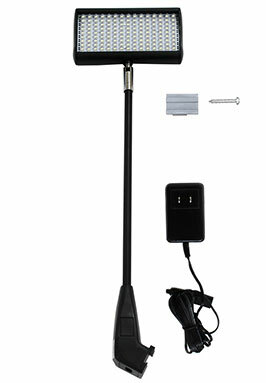 FabPop LED Light $95 ea. 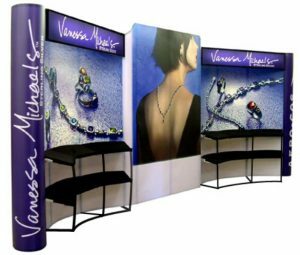 The basic FabPop fabric graphics display offers a clean, compact, easy setup for your message when applied to either the curve display wall (above) or the straight wall display (below). 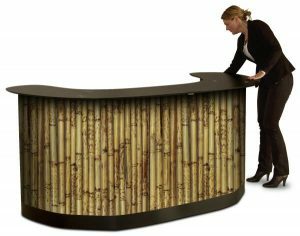 The FabPop is available as a standard front-lit (with spotlights) or a backlit (with internal lighting). 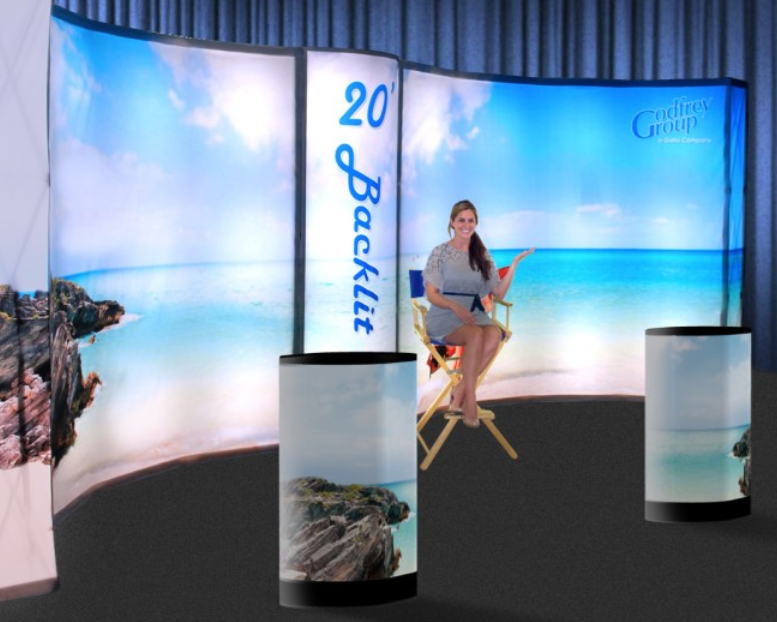 You may combine front lit graphics with backlit panels to project a strong emphasis on special features of you message or product. 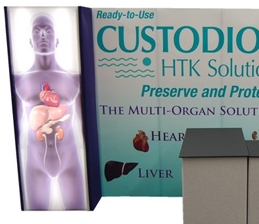 Shown above, 5 ft backlit side display panels flank each side of a 10ft front lit display with our OutRigger shelf units and other custom options. 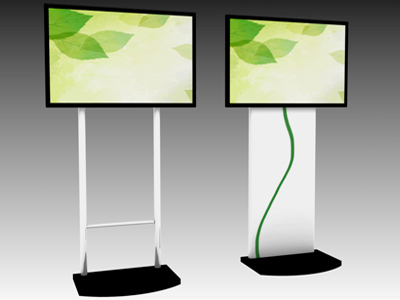 Shown in the series below, the FabPop offers a fully backlit option for a FabPop “BrightWall” display, with all graphics being backlit, to stand out in the crowd. 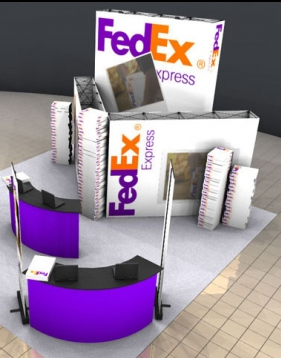 This option gives a standard size extra impact to compete with expensive custom displays. 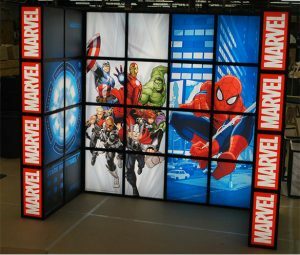 Another benefit of the FabPop is that it travels light and the backlit FabPop is a great option to heavy, custom light box displays.